Birch Evans Bayh, Jr. was born January 22, 1928, in Terre Haute, Indiana. He attended Fayette Township High School where he excelled in public speaking and leadership. Raised partly on his grandparent’s farm, Bayh developed a passion for farming and won numerous agricultural competitions, including the 1944 Indiana 4-H Tomato Championship. After High School Bayh served three years in the U.S. Army, before attending Purdue University, where he received his B.A. in Agriculture in 1951. In 1952 he married Marvell Hern and began taking courses at Indiana State University, all the while running the family farm. In 1954 he was elected to the Indiana House of Representatives, where he served two years as Speaker and four years as Democratic Floor Leader. At the time, Bayh was the youngest Speaker in Indiana state history. At the same time he was a legislator, Bayh studied law at the Indiana University School of Law and received his JD in 1960. At age 34, Bayh was elected to the United States Senate in the 1962 midterm elections, defeating 18-year incumbent Homer E. Capehart. - Author of two constitutional amendments: the Twenty-fifth Amendment on Presidential and Vice Presidential succession, and the Twenty-sixth Amendment that lowered the voting age from 21 to 18 years of age. - Author of the landmark legislation Title IX to the Higher Education Act that mandates equal opportunities for women students & faculty. - Author and co-sponsor of the Bayh-Dole Act that enables universities and small businesses to gain ownership of federally-funded copyrights. - Architect, the Juvenile Justice Act. - Chairman of the Senate Select Committee on Intelligence. Bayh ran unsuccessfully for the 1976 Democratic Presidential nomination. He was defeated in his fourth Senate reelection attempt by Indiana's 4th congressional district congress member Dan Quale in 1980. Bayh’s eldest son, Evan has had a successful political life as well, serving as Indiana Secretary of State, U.S. Senator (two terms), and Governor of Indiana (two terms). Birch Bayh spent his retirment living in Easton, Maryland, with his second wife Kitty. He was a fellow at the C.V. Starr Center of Washington College in Chestertown, Maryland. Bayh was inducted into the Law School’s Academy of Law Alumni Fellows and presented with an honorary LLD in 1995. He received the Indiana University Distinguished Alumni Service Award in 2009. 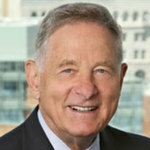 Birch Evans Bayh, Jr., died on March 14, 2019, at the age of 91. The Art of Leadership: A Companion to an Exhibition from the Senatorial Papers of Birch Bayh. Additionally, the documentary film ""Hey, Look Him Over: A Look Back at the Career of Senator Birch Bayh" (Sautter Films, 2005) is available in the Jerome Hall Law Library [Circ.Desk E 840.8.B29 H4 2005]. "Birch Evans Bayh, Jr." (1928). Notable Alumni. 6.